During June-July 2010 we have three times traveled to the alienated zone of the Chornobyl Atomic Power Station (CAPS), which noticeably added to our knowledge of raptors in this area. A number of visits had been also taken before, to study wintering fauna of Falconiformes. Two visits in the alienated zone of CAPS have been associated with our participation in shooting a documentary movie about nature and self-settled people in the alienated zone. Therefore, materials on birds during these visits were collected along the way, although they gave good results. From 5 to 08.07.2010, this area has been surveyed to determine distribution and numbers of birds of prey. We used the methodology of point census. Working in open areas where raptors are well- visible, we did counts with the optics at fixed points for a certain period of time. We recorded flying and hunting birds. Thus, we have partly examined a central section of the Uzh river valley, some of the reclaimed areas, abandoned farmlands and meadows. Birds of prey were also recorded during our movements. 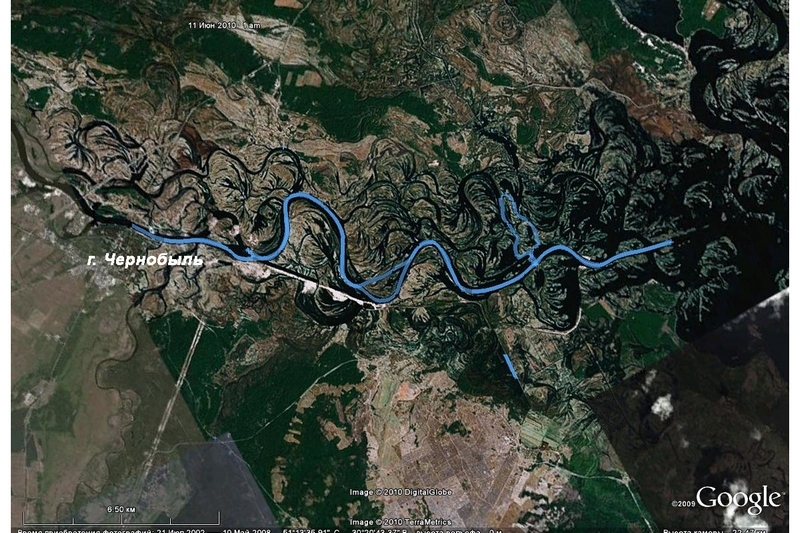 It has been also surveyed by vessel the section downstream from Chornobyl through the Pripyat river delta to the confluence with Kyiv Reservoir and in the opposite direction. Taking into account meanders of the river, the distance of the journey by vessel was about 60 km. Within the zone, we investigated the area of Ivankovo Region and only few areas of Polissia Region. We didn’t survey large forest stands of the north-western part of the alinetated zone – Polissia Region. Despite almost absence of human disturbance in this area, we failed to observe a large number of birds of prey. This fact was rather unexpected for us. Most likely it was reasoned by the processes of succession, which, after the catastrophe at the atomic station, inititiated active changes in hunting territories of many species of birds of prey. Currently, the majority of open areas are heavily overgrown with tree communities, but most adversely affected by the density and height of the grass, which makes it impossible for raptors to hunt. Such processes are particularly well pronounced in the valleys of the rivers and rivulets, on the reclaimed lands. They are favorite hunting areas of raptors. We visited large areas of drained swamps on the left bank of the Pripyat, villages of Krasnoye, Mashevo, which are located closer to Belarus, and for a long time of observation we have almost never met birds of prey. Below there is the information for each species of raptors which we have observed. Honey Buzzard. It was recorded 8 territorial birds. The Honey Buzzard was met in different kinds of forests, but mostly registered near decidious and mixed forests. Hen Harrier. Near the village Il’intsy on 9.06 we observed two females hunting 1 km apart from each other. That day we did not manage to reveal their type of stay because of our busy work shedule. Again we visited this territory in the afternoon of 6.07 but did not see the birds, only recorded a male of Montagu’s Harrier. Montagu’s Harrier. It was recorded one territorial male and a pair of birds. Marsh Harrier. On 6.06 we went along 60 km of the Pripyat floodplain by vessel (downstream and upstream) and despite of abundance of suitable breeding habitats we saw only one male of the Marsh Harrier. Altogether, in the area of our investigations we recorded 11 territorial birds. Sparrowhawk. We were lucky to find only one territorial bird. The species is rather hidden that is why rare meetings of them in summer do not allow a reliable estimation of numbers. Common Buzzard. Though the Common Buzzard is the most numerous species within the territory of Polissia as well, we saw it rather rare. We recorded 12 territorial birds. Supposed, such low numbers are reasoned by high grass in their hunting sites. Short-toed Eagle. We discovered 5 territorial birds, only one of them on the left bank of the Pripyat. The juvenile Short-toed Eagle sucessfully hunted on the left bank of the Pripyat, two km to the west of the village Krasnoye. Probably, in the alientated zone, up to 15 pairs of these birds may breed. Lesser Spotted Eagle. We revealed 5 territorial Lesser Spotted Eagles. All the birds were registered near humid areas. One pair had a nest with tracks of droppings under it, indicating on the successful growth of a chick. White-tailed Eagle. The population of birds breeding in the alienated zone is in a good condition with an increasing trend. Going the Pripyat downstream by vessel we counted 8 birds on 6.06, 4 of them were juvenile. Coming back the same route we noted 6 birds including those counted before. We also saw the White-taled Eagles on a cooling pond, on 8.06 there were 4 juvenile and 1 old individuals. Several times we frightened a young bird off a roof of the buiding located at the pond shore. At the same place, in pond waters, we found a dead body of another young bird, the reason of its death unknown. Visiting areas of the both banks of the Pripyat we often registered the White-tailed Eagles upstream and downstream from Chornobyl. Hobby Falcon. We have found 6 territorial birds, of them 2 pairs bred on pylons of power line in nests of the Hooded Crow. Kestrel. This species is worth paying particular attention. No other species in Polissia zone we managed to observe in such a high number as this falcon. Among all species of birds of prey the Kestrel ranks first by its number, taking the lead over the numerous in other regions Common Buzzard. The Kestrel was observed in almost all open areas but important factor for the species is availability of breeding sites. The birds were registered on pylons of power lines, in abandoned villages, river bridges and railroad, in buildings at the atomic station, in the city of Pripyat. The city itself, S.P.Gashchak pers. comm., is inhabited with about 10 pairs of Kestrels. For a short time we revealed there 7 pairs of falcons. Apparently, at present the city is bred by over 10 pairs. On 10.06 we have found the Kestrel nest located at the balcony of 14th store in the sixteen-storeyed block of flats and contained 5 chicks aged 5-6 days. We ringed them 8.07 when they could not fly, but quickly moved along the balcony. Two fledglings we observed 7.07 in the village Il’intsy, one we succeed to catch and mark with a ring. 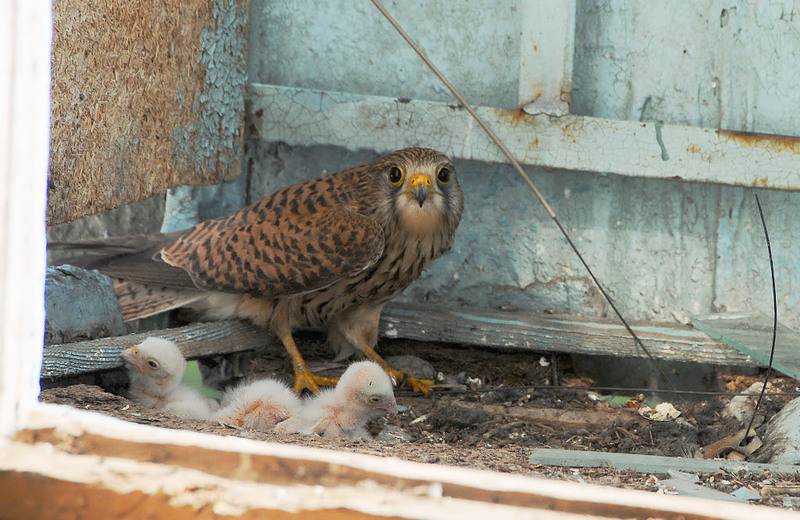 A brood of the Kestrel was observed in the village Hlynka, where birds bred in a niche of the half-destroyed buiding of church. Two broods we recorded on 13.07 at the western outskirts of the city of Pripyat. Totally we met 36 territorial birds. Of them 13 pairs bred in Corvidae nests on pylons of power line, 9 pairs in buildings of abandoned villages, 4 pairds in niches of bridges (a pair on each bridge), 2 pairs in pipes near the cooling pond, in a building of the concrete plant – 1 pair and 7 pairs in many-storeyed blocks of flats of the city of Pripyat. Total numbers of the Kestrel in the alienated zone can reach to 50-60 pairs. We are sincerely thankful to the Director of the building firm “Remontnik” (Kyiv) A.A. Mikhalko for sponsor support of our works.